A bright room in 20-22 Chambers Street, Monday morning. Dr Carold Richardson and Prof Richard Williams warmly usher me to a table covered in brown paper. On it, a feast of crayons, pencils, broad felt-tip pens, the smooth black biros, scissors and glue sticks await my eager hands. And some 8” by 5” file cards. “Make one!” I am told. 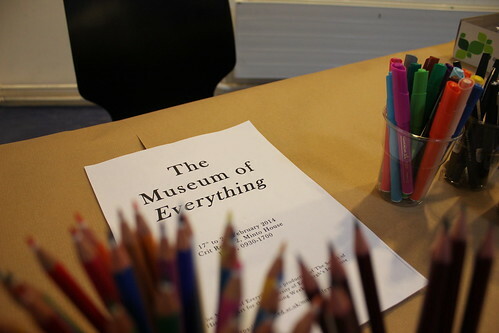 The Museum of Everything is the name of the installation. Entering the room, I see objects and text covering a small portion of the walls, all stuck to, drawn or written on file cards.